Put an end to the endless time it takes to charge a smartphone. With the increasing battery capacity and smartphones turning themselves like phablets, the time taken to charge a phone is certainly on the high side. 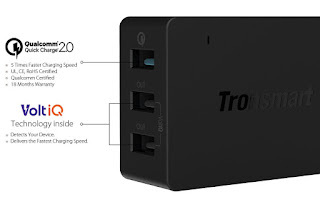 Tronsmart Quick Charge USB wall charger is a savior with three USB ports to charge your devices quickly at the same time. Use coupon code JANQXRAX to score the deal. Developed by Qualcomm Quick Charge 2.0 Tech, Charge up to 75% faster. In laboratory tests using a 3300mAh battery,A Quick Charge 2.0 enabled device went from 0% to 60% charge in 30 minutes, while a device without Quick Charge 2.0 using a conventional (5 volt, 1 amp) charger achieved just a 12% gain in the same 30 minutes. A device with Quick Charge 1.0 managed a 30% charge in that time period.